There is a common belief that one should not look at the moon on Ganesh Chaturthi (Vinayaka Chaturthi) day. There is an interesting story to this regard in Hindu scriptures. On a Ganesh Chaturthi day, Ganesha was eating sweets from the houses that were celebrating his birthday. Ganesha’s stomach was overfilled with ‘Modaks’ and other sweets and he could not move. So, he decided to ride on his vehicle mouse. Mouse or Moshika was happily carrying Ganesha but suddenly a snake appeared and the mouse lost his balance and Ganesha fell down. Due to the intensity of the fall, the sweets in the over bloated stomach of Ganesha came tumbling out. Ganesha was not ready to give up the sweets and stuffed them back into his stomach and used the snake as rope to keep the stomach and the sweets intact. 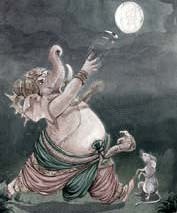 Suddenly, Ganesha heard someone laughing and on looking he found that the moon was making fun of his fall. In a fit of rage, Ganesha removed one of his tusks and hurled it at the moon and cursed that henceforth no one will look at the moon on Ganesh Chaturthi day. If anyone looks at the moon on the day, he/she will meet with numerous obstacles in life. To be freed from the curse he/she should read or listen to the story of Lord Krishna and the Syamantaka Jewel in Srimad Bhagavad Purana.